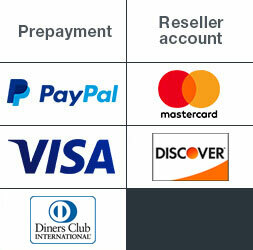 Don’t banner about – have your PVC banners printed by us, the seductively inexpensive online print shop. All eyes will be on them. While their sturdy eyes permit easy hoisting and lowering. There’s no ban on attractive banners – so show your colours! Banners have been with us since ancient times in many shapes and forms. What they all have in common is the wish to simply hang. On buildings, scaffolds, fences or just about anything else. That answer is ... exactly 131! This is variety that pays. For you and for us. We make your PVC banners out of washable, weatherproof, tear-resistant 500gsm polyvinyl chloride (PVC). That’s exactly half a kilogramme per square metre. 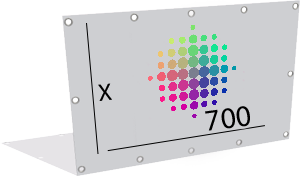 The inks we use to print your PVC banners on one side in full colour are every bit as great as the material. Thanks to their high UV-fastness, they keep on highlighting your firm, product, event or services in brilliant colours for years. Nor would you expect anything less from us. 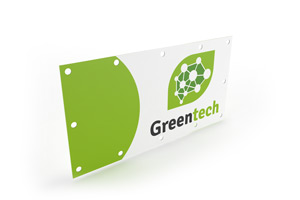 We equip your PVC banners with sturdy grommets on all sides for fast and easy hanging using ropes or lines. This ensures that you can flexibly adjust them according to demand and the season in just a few simple steps. 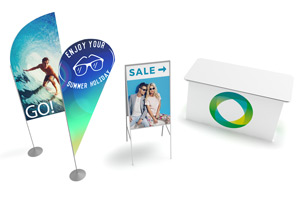 We’re happy to print lots of between one and 15 PVC banners for you and deliver them within five to seven working days at no extra charge, as our prices always include shipping. This applies to printing of PVC banners and to our customer service in general. We aim to satisfy you in every respect. And we succeed so well in this endeavour because we take criticism seriously. Our policy is also to give a full refund to every new customer who isn’t 100% happy with our work. And regulars know that we guarantee them a solution that will restore their satisfaction.